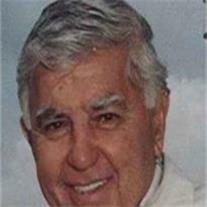 Anthony F. Amorosi, 87, of Sun Lakes, AZ, formerly of Cedar Grove, NJ, passed away on March 8, 2013 at home. Andy is survived by Eleanore, his beloved wife of 53 years. He was born in Jersey City, NJ and served in the United States Navy during World War II. Prior to his retirement, Andy owned an insurance agency in New Jersey. He enjoyed travelling the world with Eleanore and together they explored places as diverse as Egypt and Italy, Israel and Poland. Always remarkably youthful for his years, Andy played softball well into his seventies. In addition to his wife, he leaves behind his daughter Elizabeth (Lee Johnson) of Scottsdale, AZ and his son Andrew (Jennifer) of Whitehouse Station, NJ. He was the much adored Papa to his grandson Patrick Johnson and granddaughters Gabriella and Juliana Amorosi. Andy is also survived by his brothers, John of Hasbrouck Heights, NJ and Louis of Sun Lakes, AZ. In lieu of flowers, please make a contribution to the charity of your choice to honor the pleasure Andy received in giving. A funeral mass will be celebrated on Thursday, March 14, 2013 at 10:00 at St. Theresa Catholic Church, 5001 E. Thomas Road, Phoenix, AZ 85018. Arrangements by Bunker’s Garden Chapel.